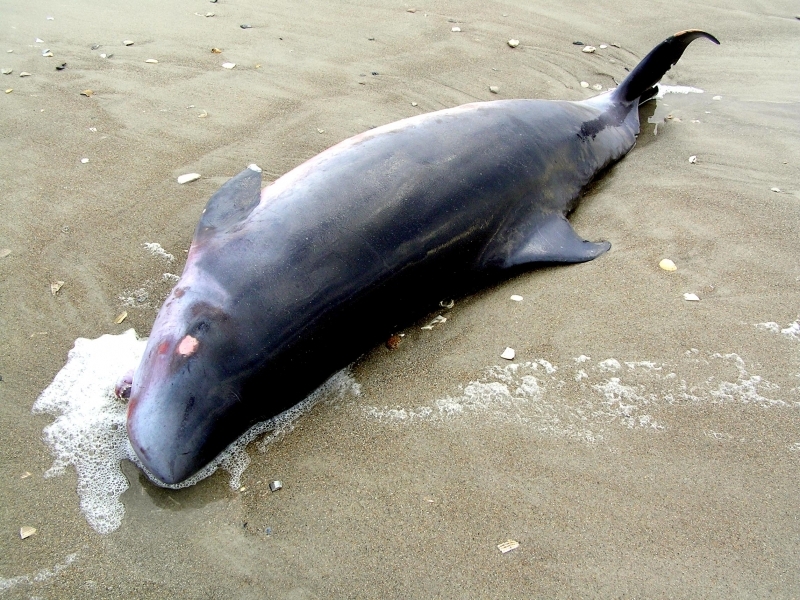 Pygmy Sperm Whales are small cetaceans with stocky bodies that narrow on the posterior (rear) end of the body behind their dorsal fins. 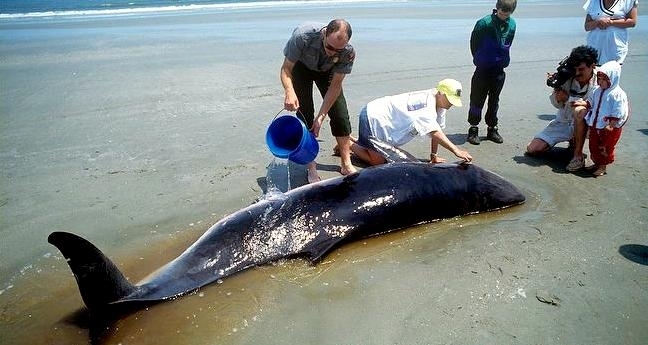 Adults measure 3-4.25 meters in length and weight a maximum of 408 kilograms. 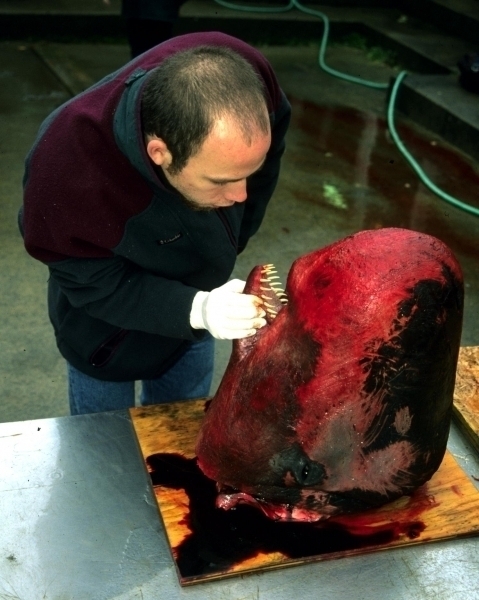 These whales have 12-16 sharp, curved pairs of teeth in their lower jaws. 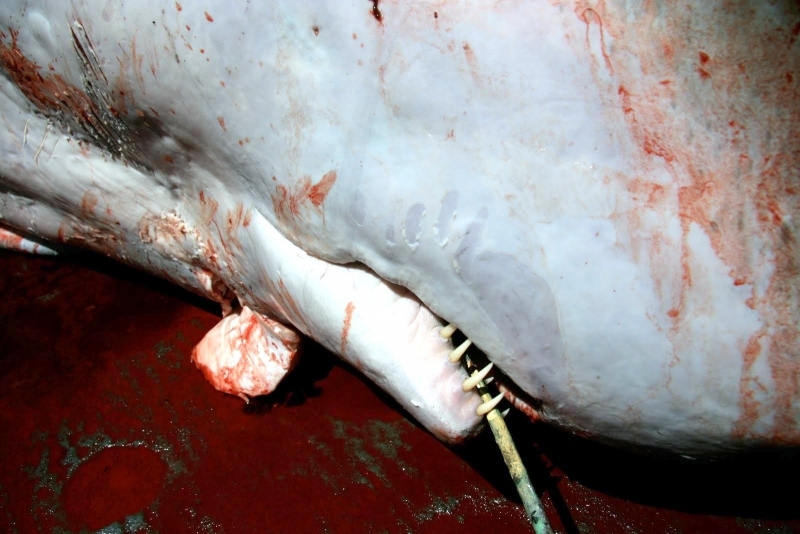 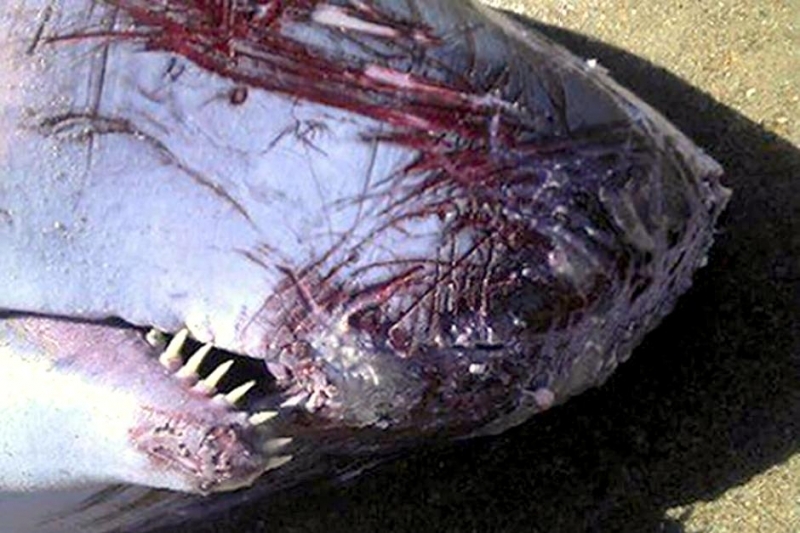 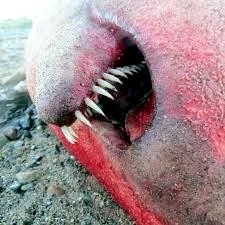 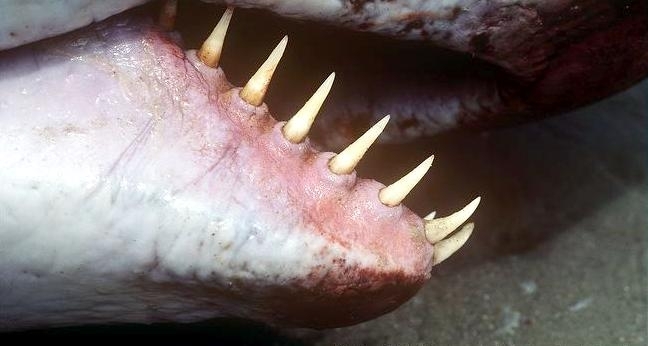 Their teeth fit into pockets in their upper jaw like its “big brother” the Sperm Whale. 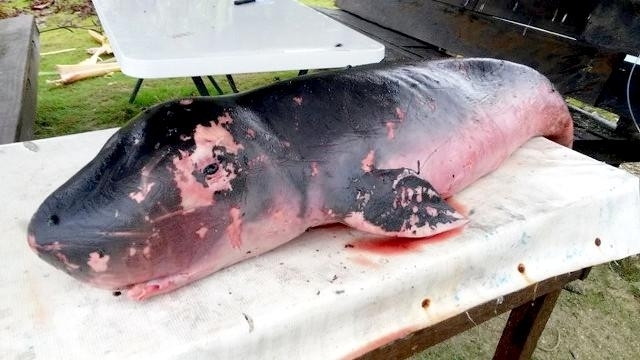 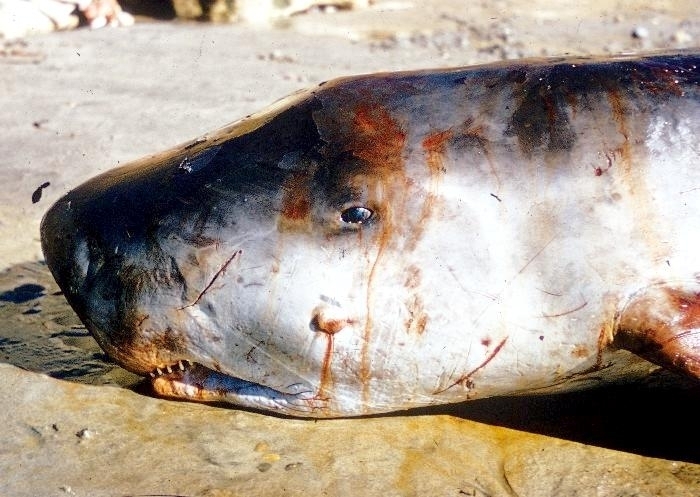 Pygmy Sperm Whales have a mark on either side of their heads known as a “false gill” because of its resemblance to the gill slits of fish which it shares with the closely related Dwarf Sperm Whale. 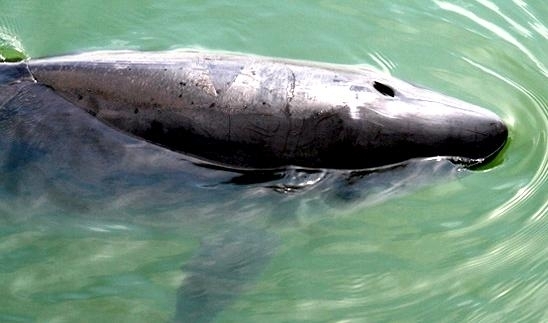 They also have markings in front of their eyes. 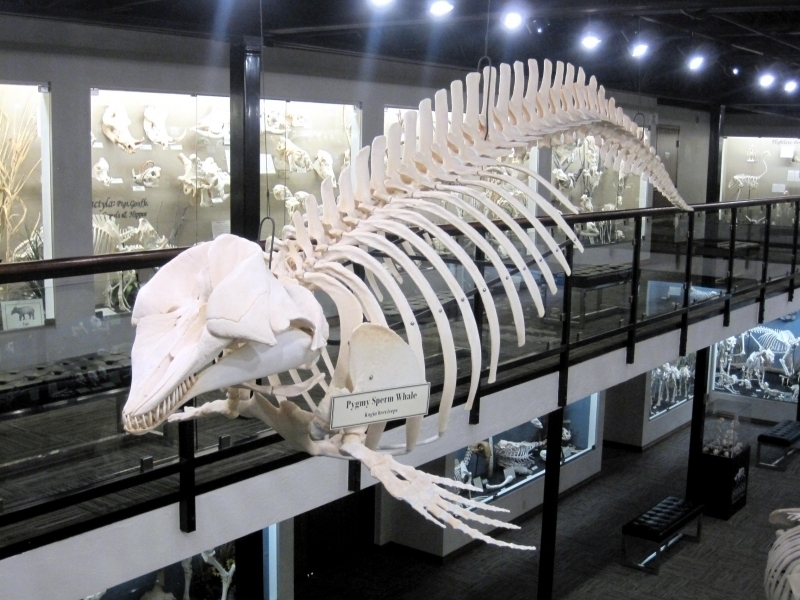 These whales expel water forward & horizontally instead of up vertically. 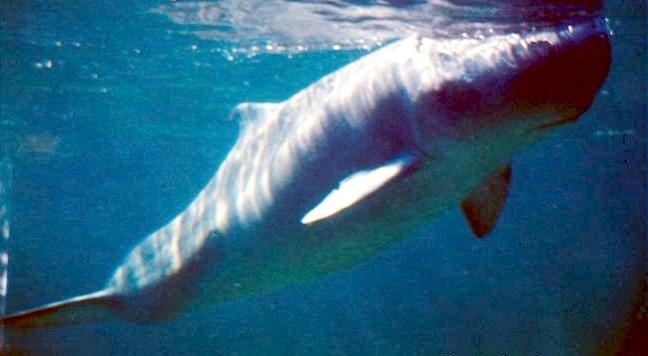 Pygmy Sperm Whales are blue-gray to black on their dorsal (upper) side, with lighter coloring on their ventral (under) side. 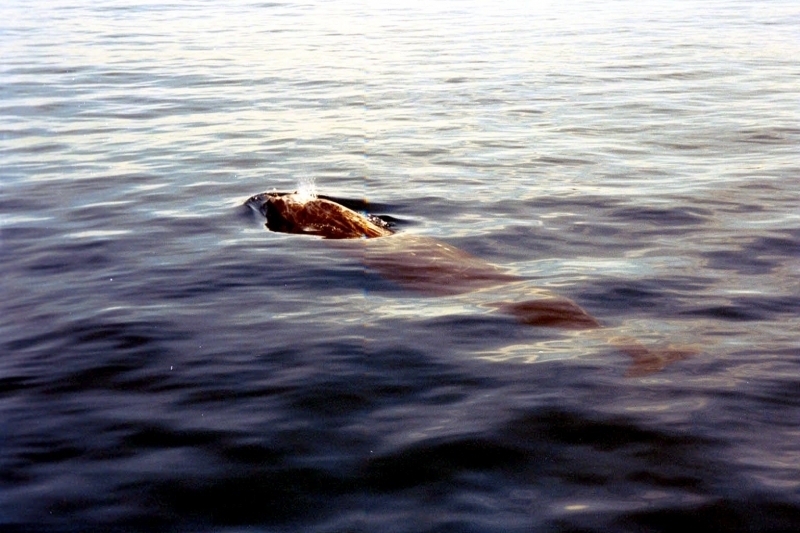 Their large, rounded flippers are located on the flanks behind and below the “false gill”. 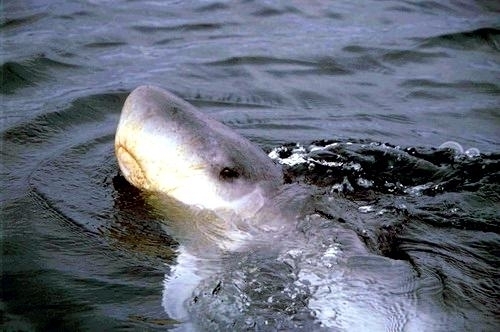 A very small, curved dorsal fin is located behind their midsection. 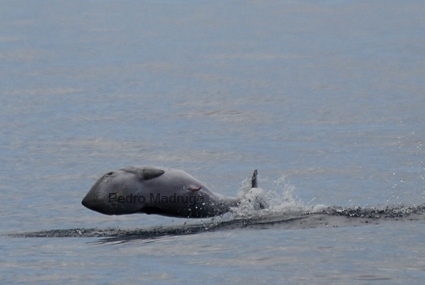 Their flukes (tails) are almost dolphin-like with a deep notch in the center. 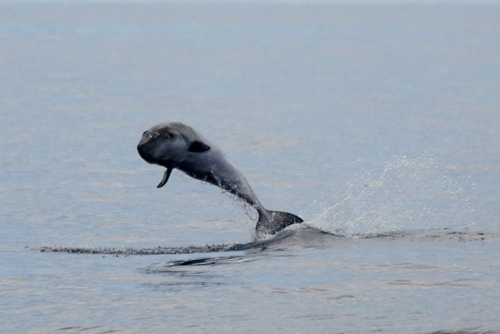 They are found either singly or in small pods of 3 to 5. 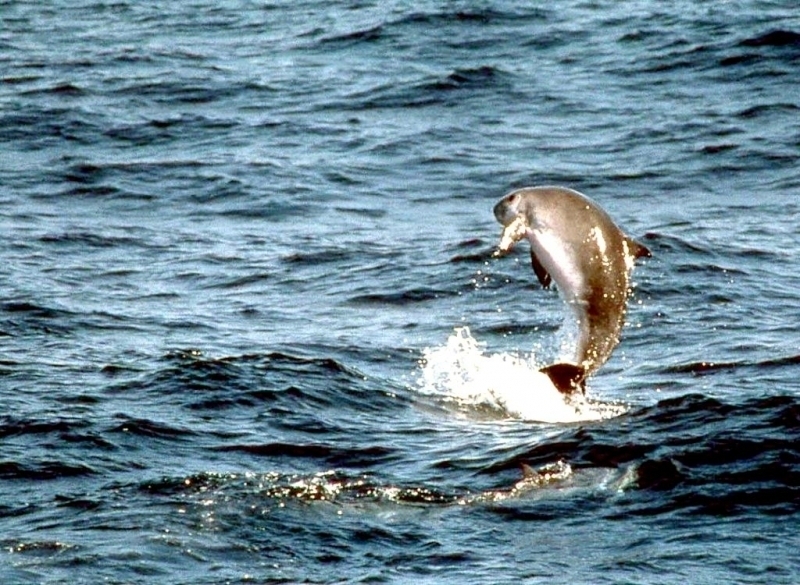 They are infrequently seen in the wild as they avoid marine traffic. 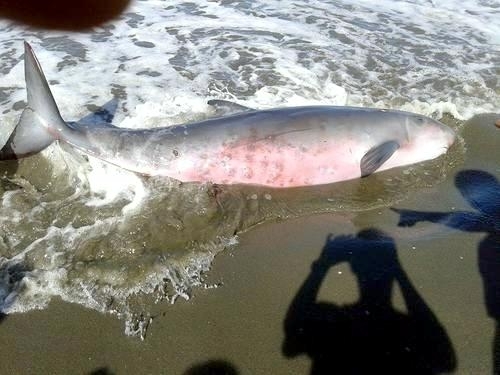 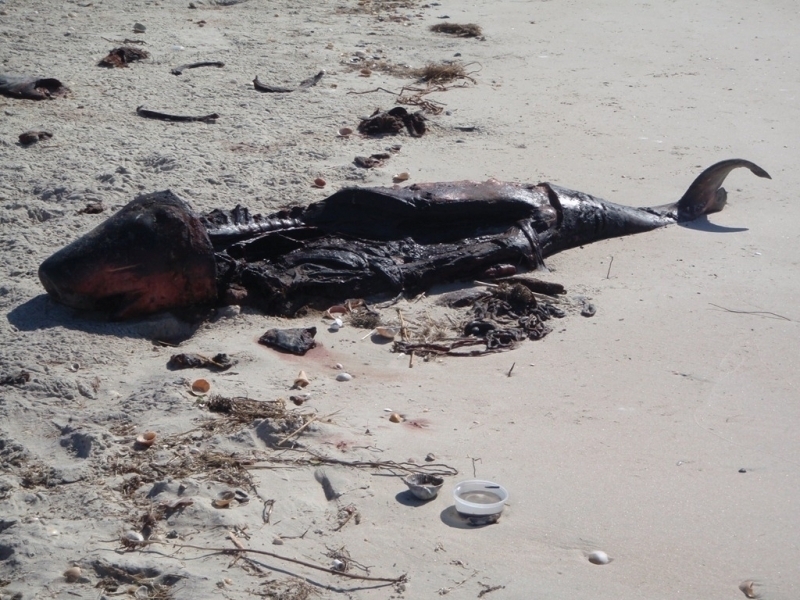 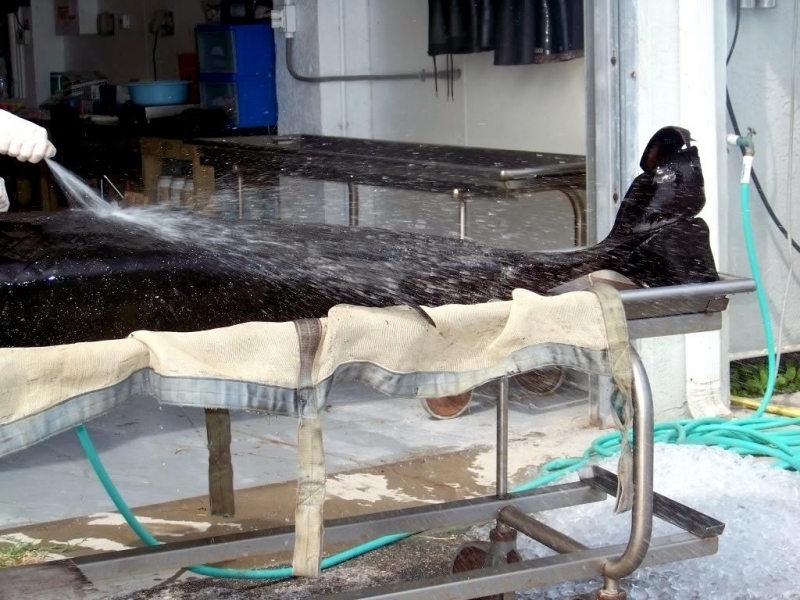 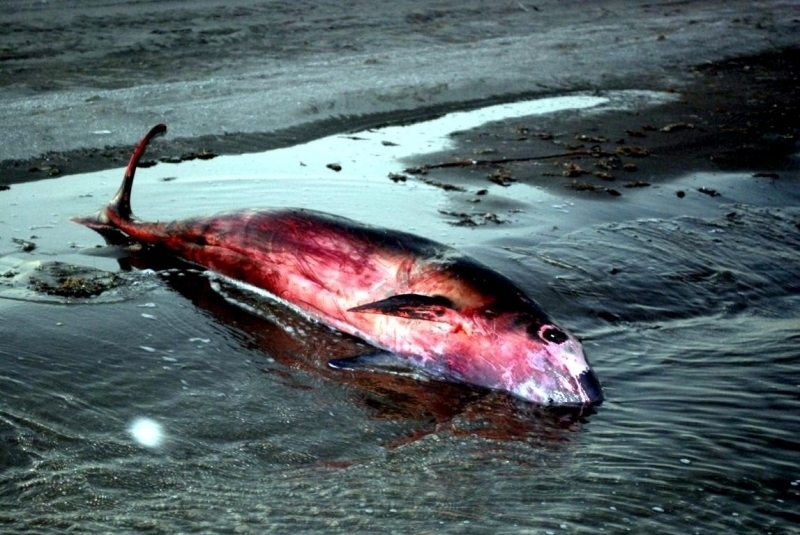 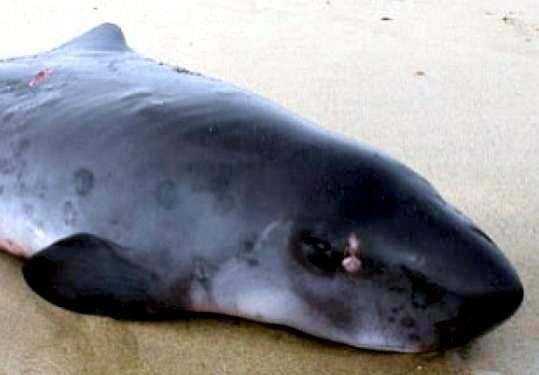 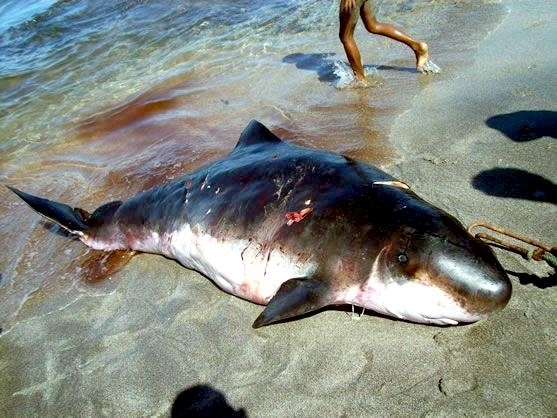 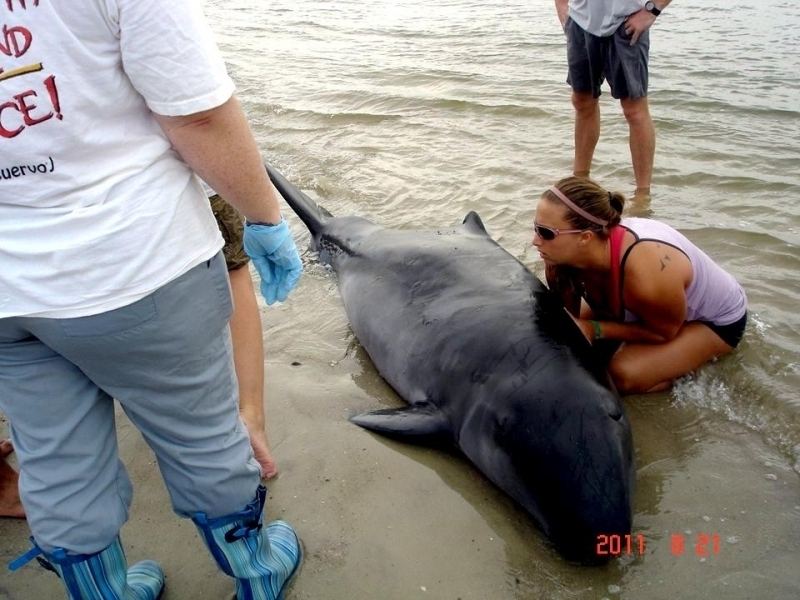 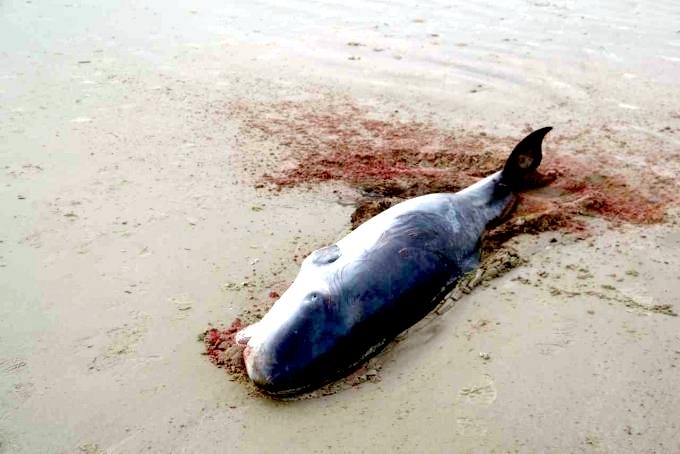 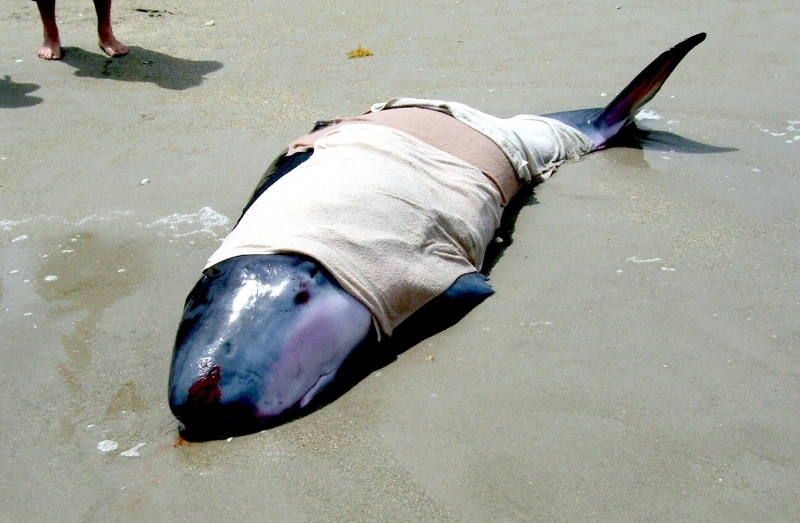 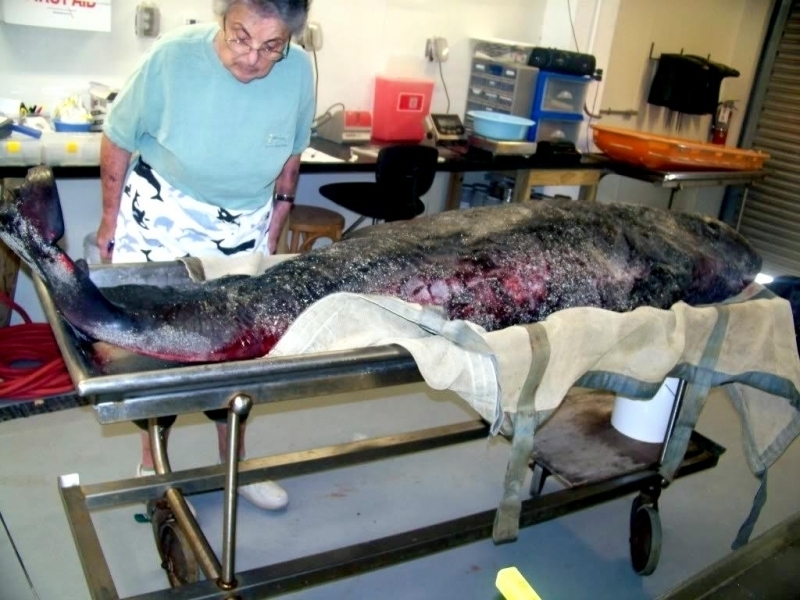 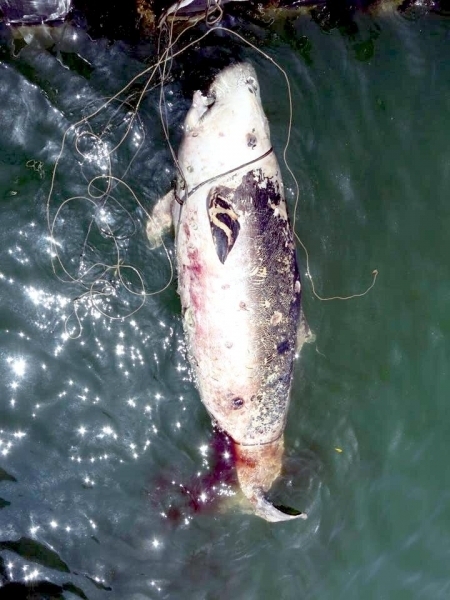 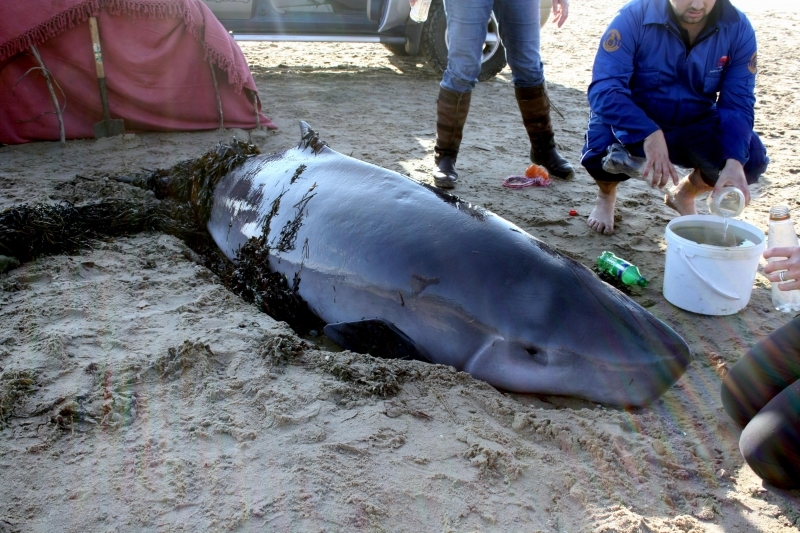 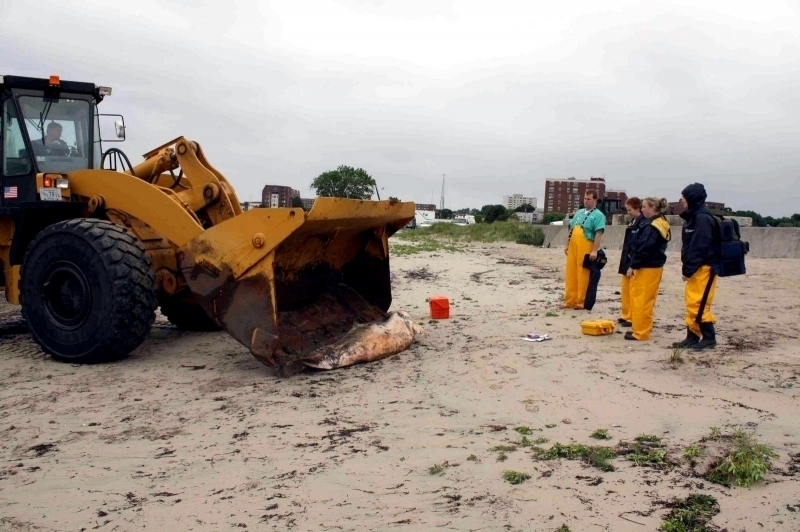 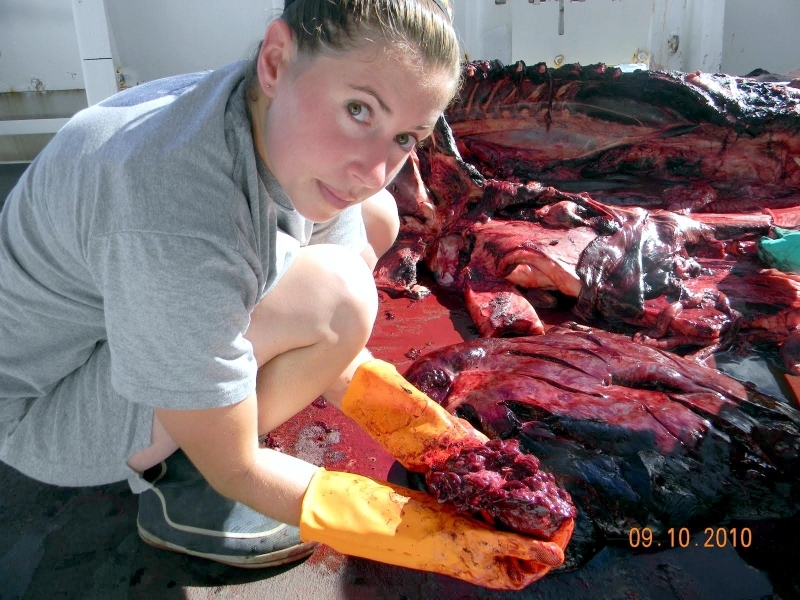 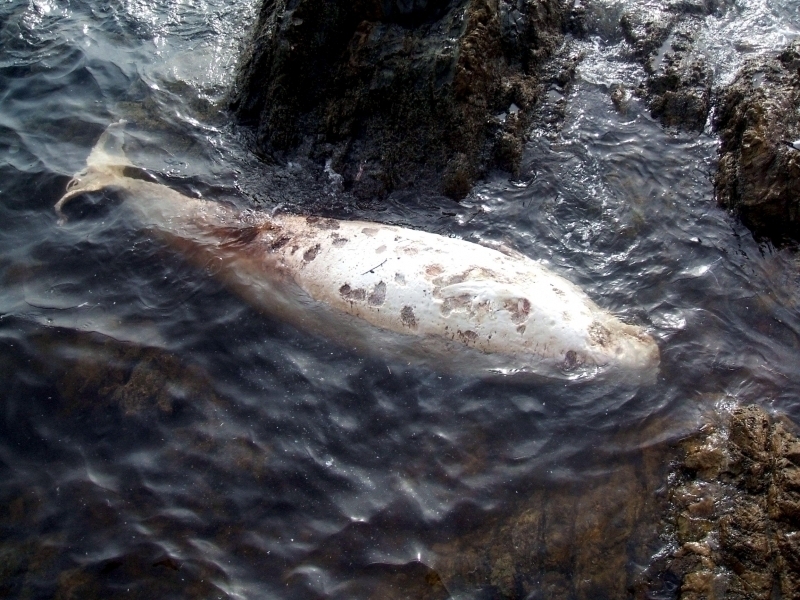 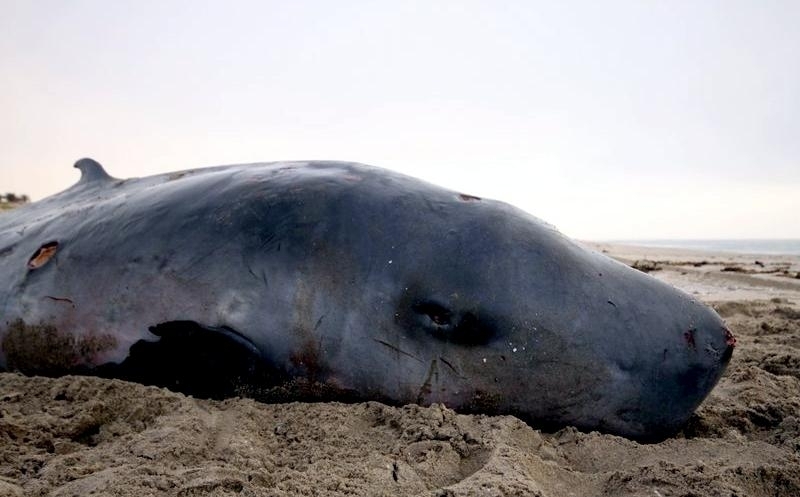 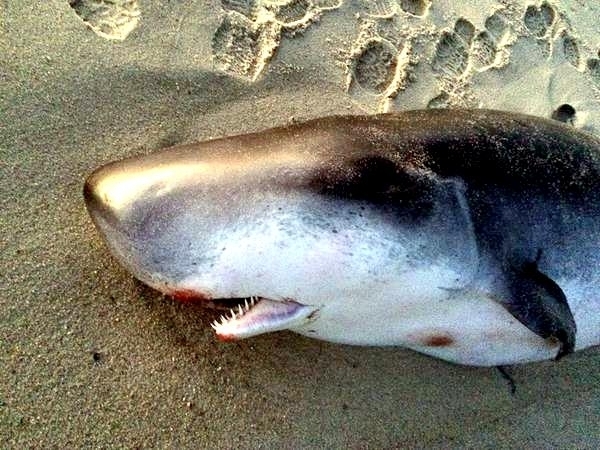 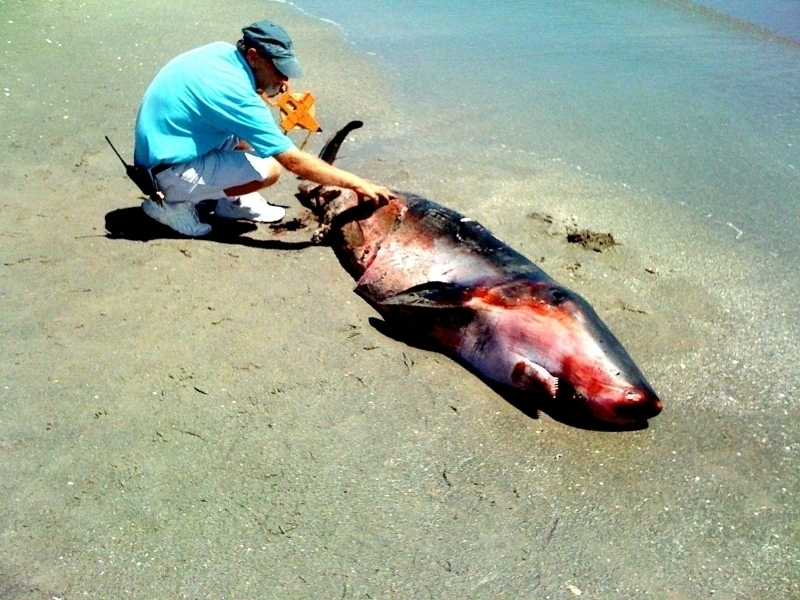 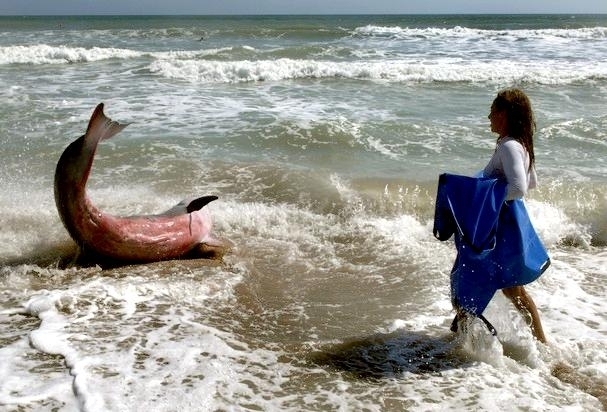 Strandings are found on coasts in the southeastern United States, some are found alive either as single individuals or cows with their calves. 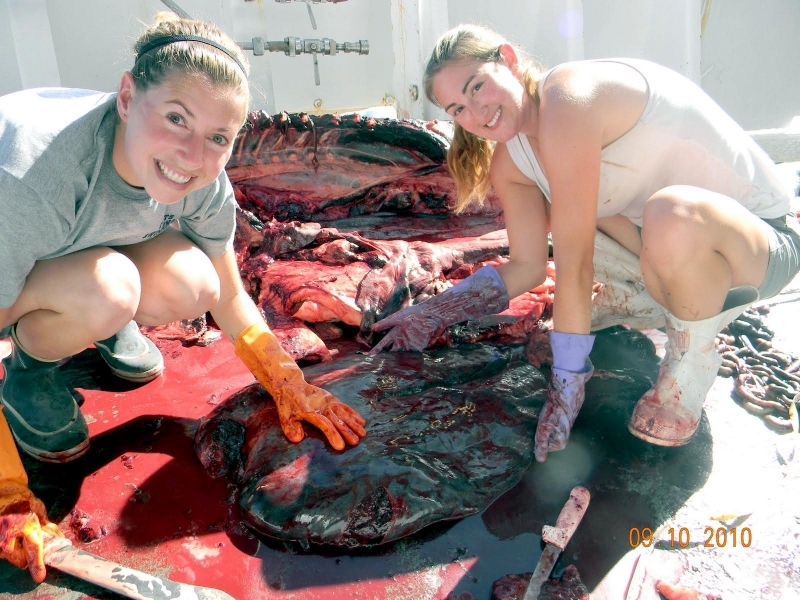 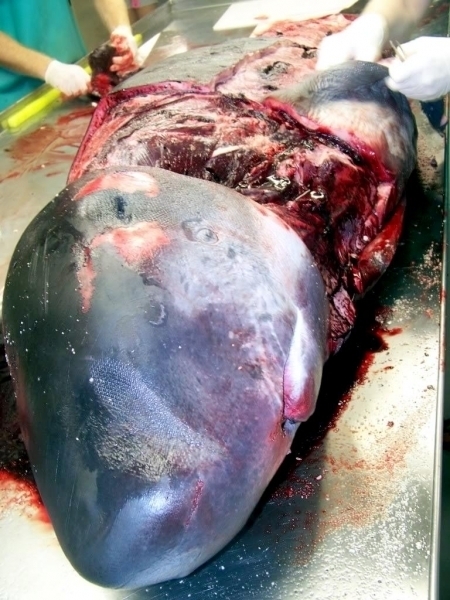 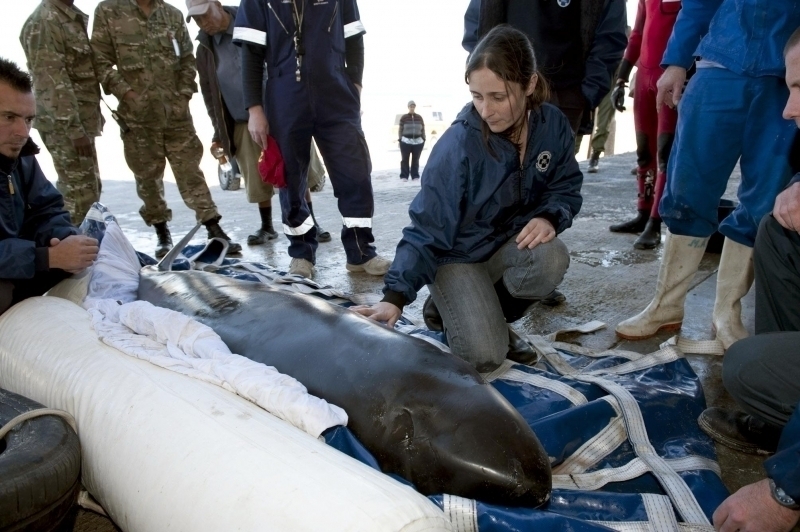 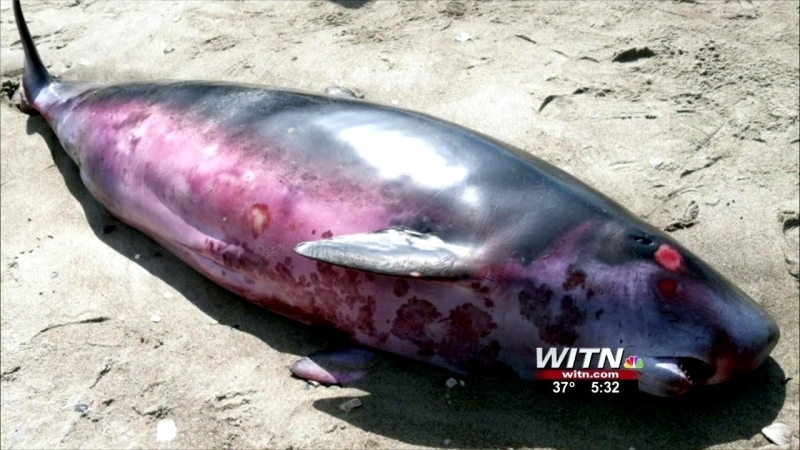 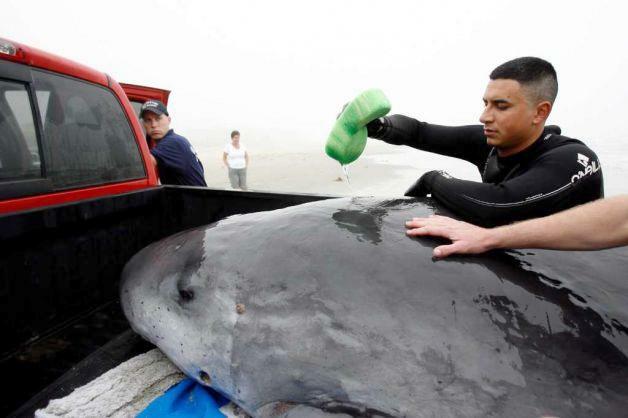 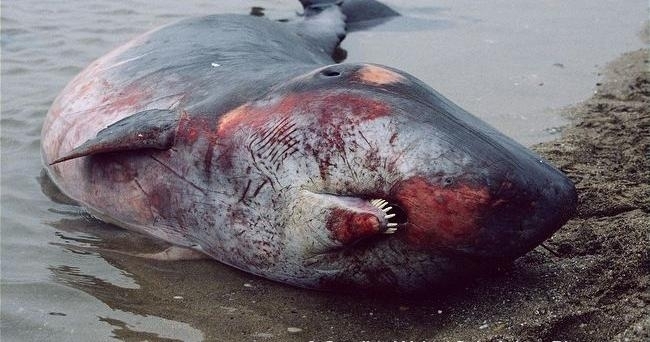 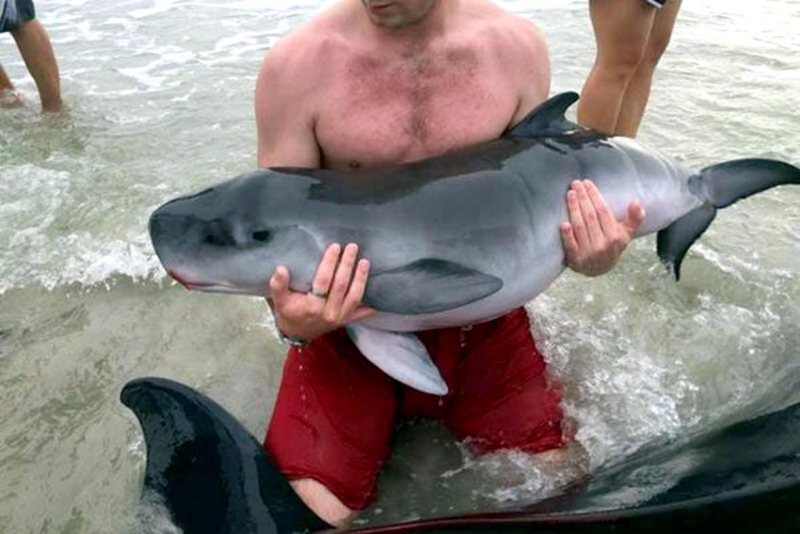 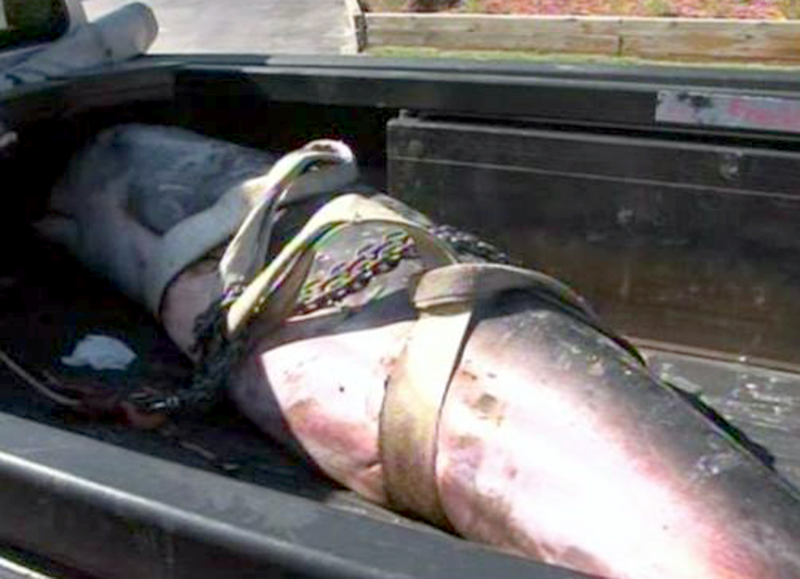 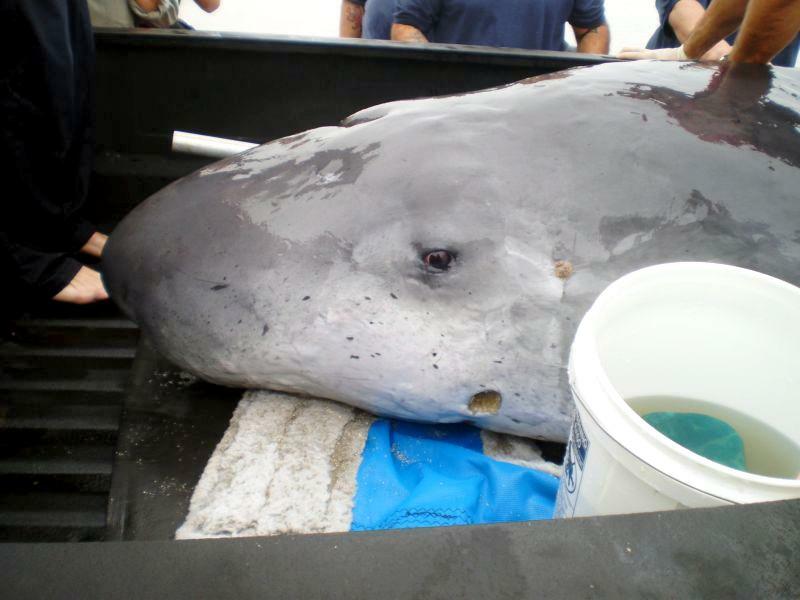 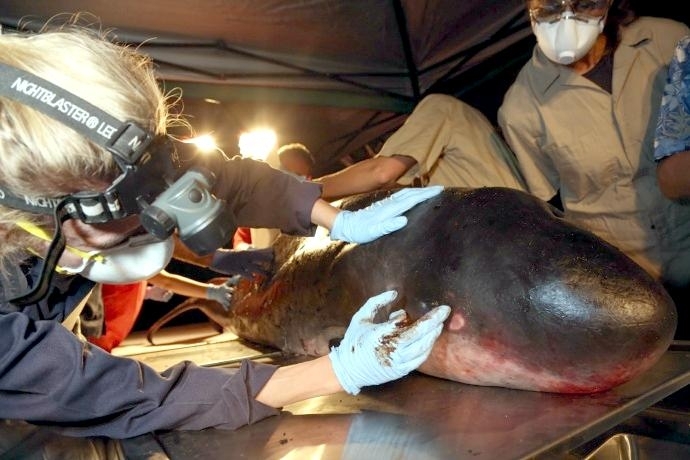 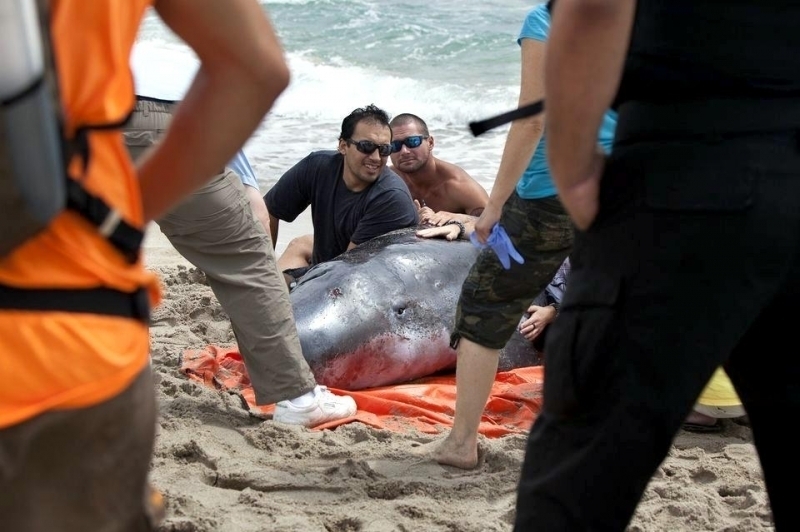 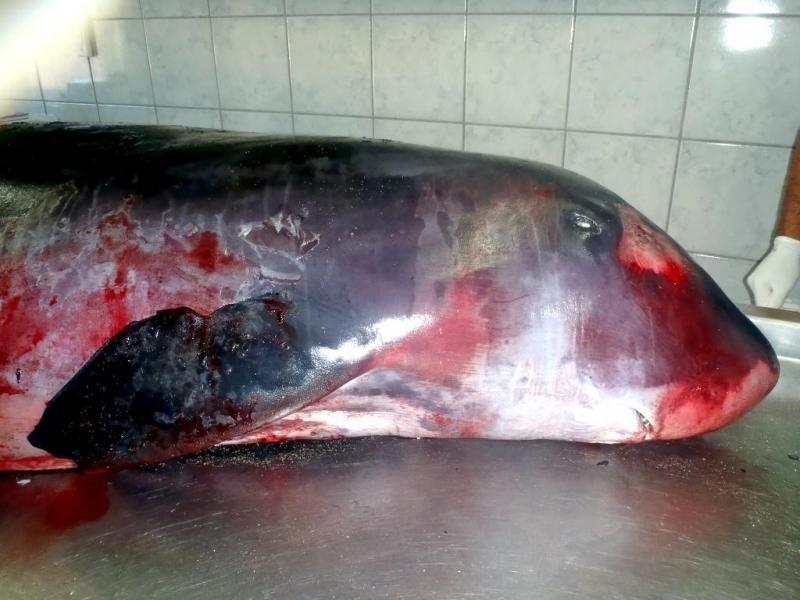 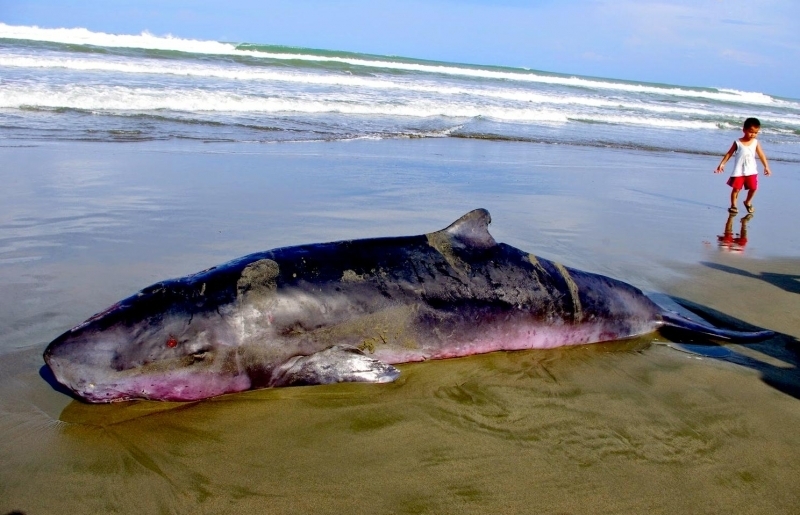 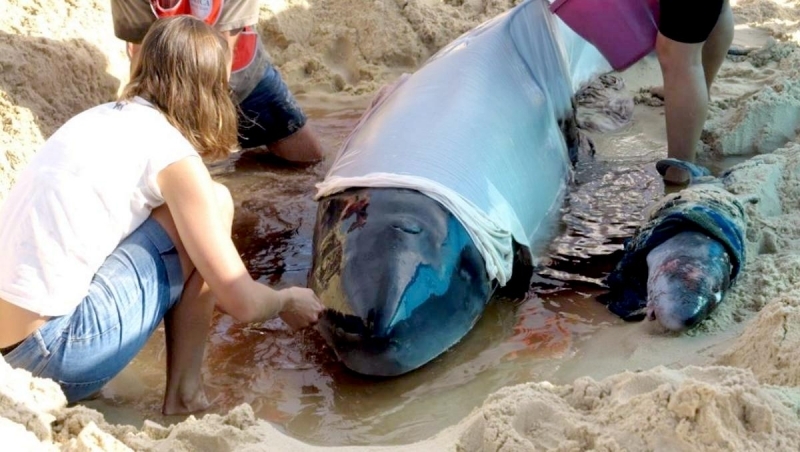 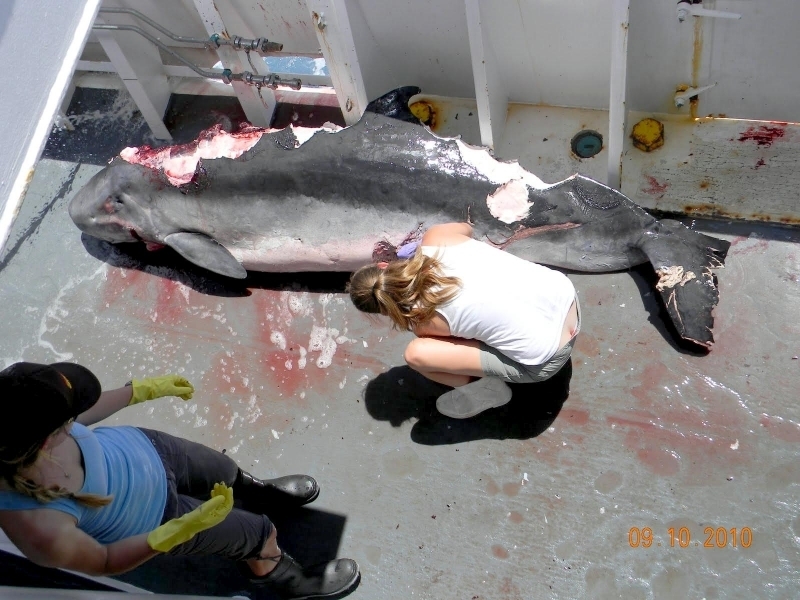 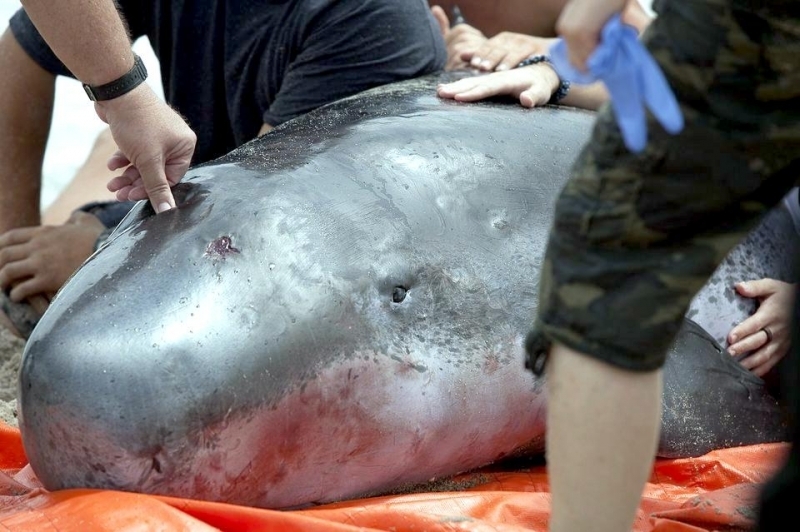 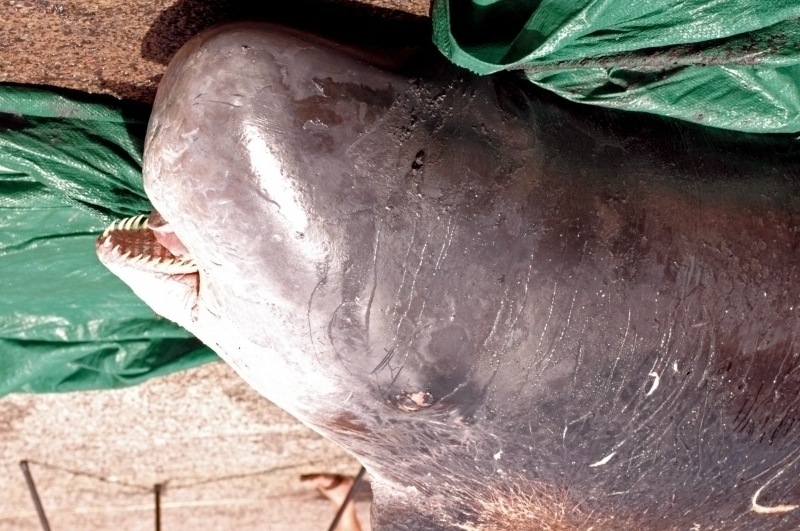 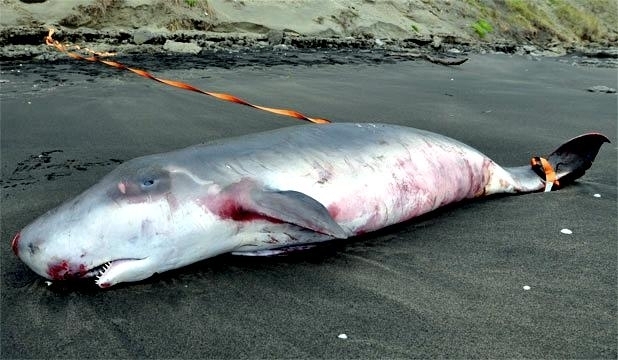 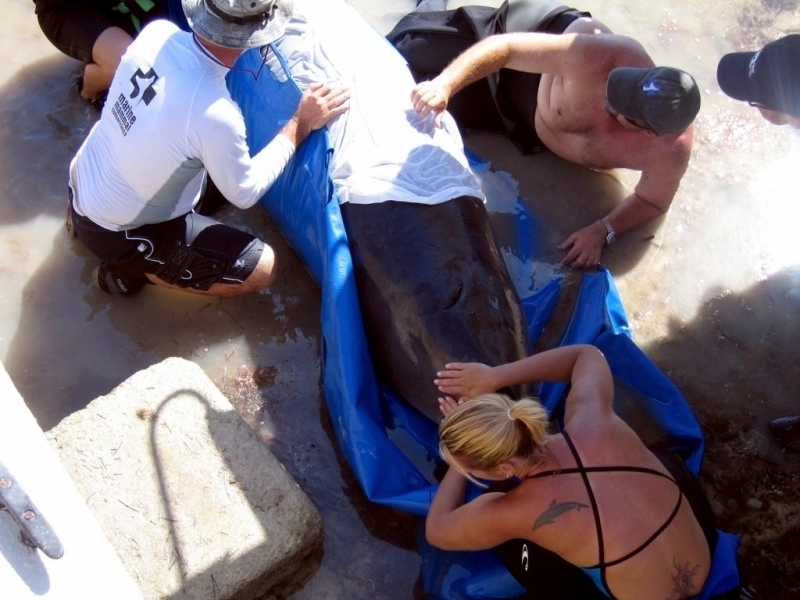 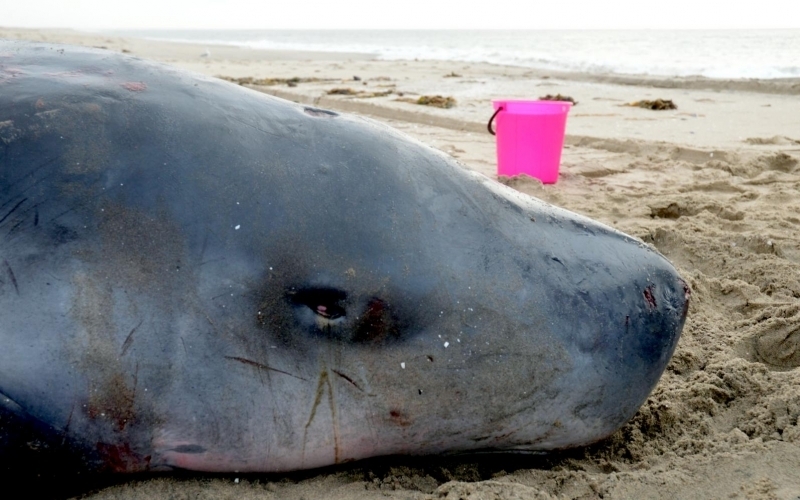 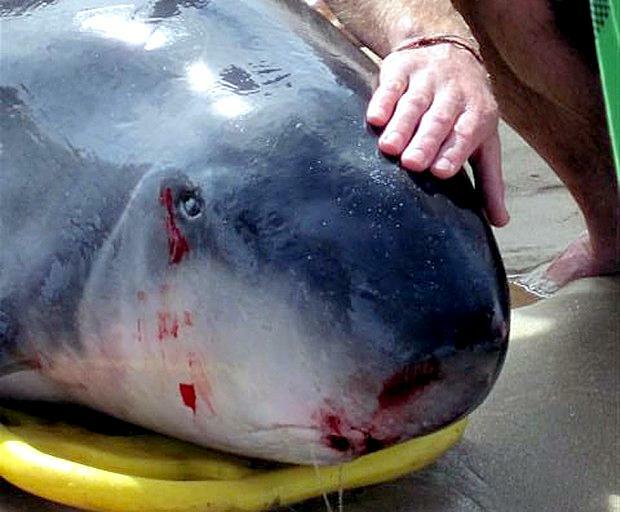 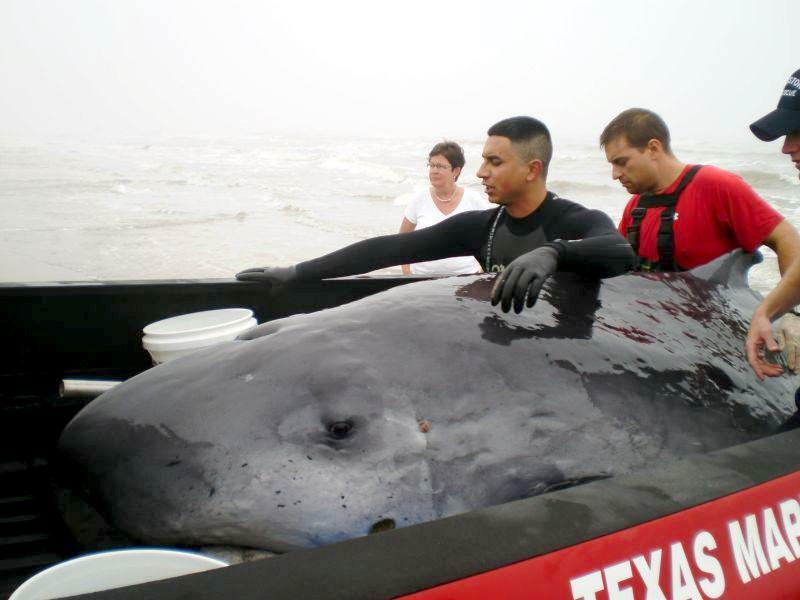 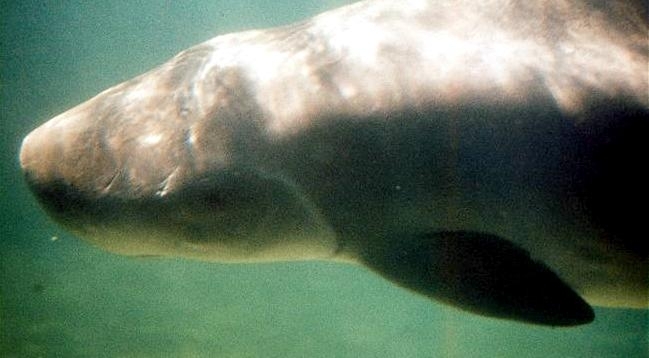 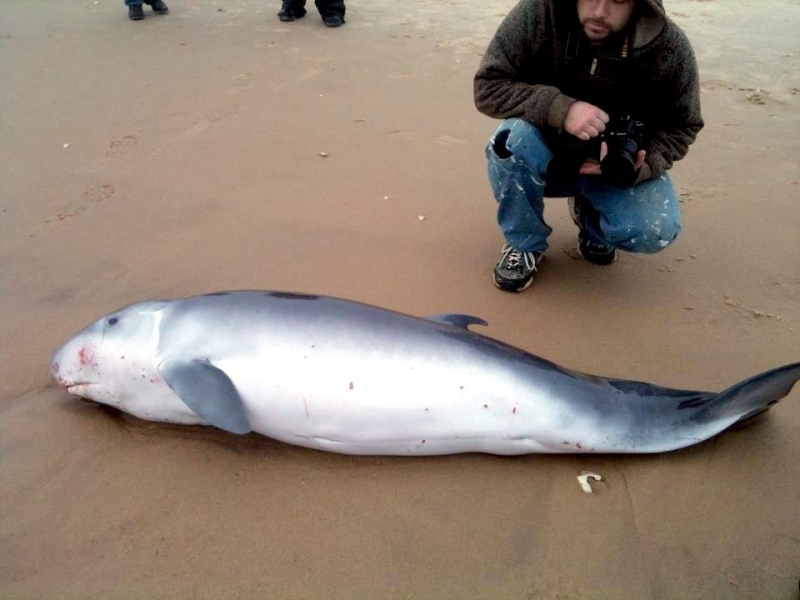 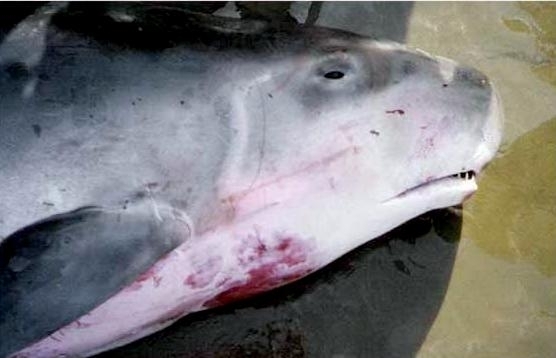 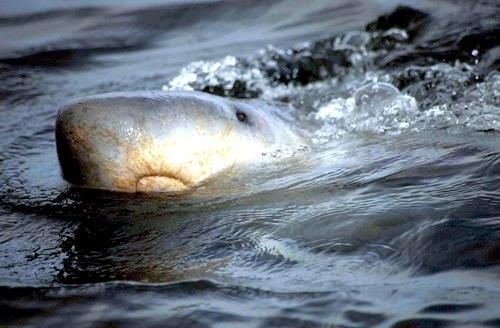 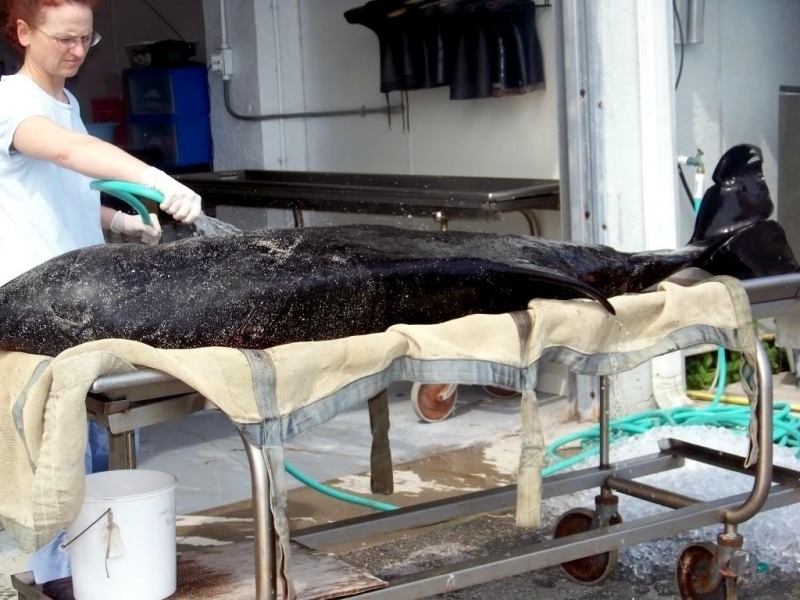 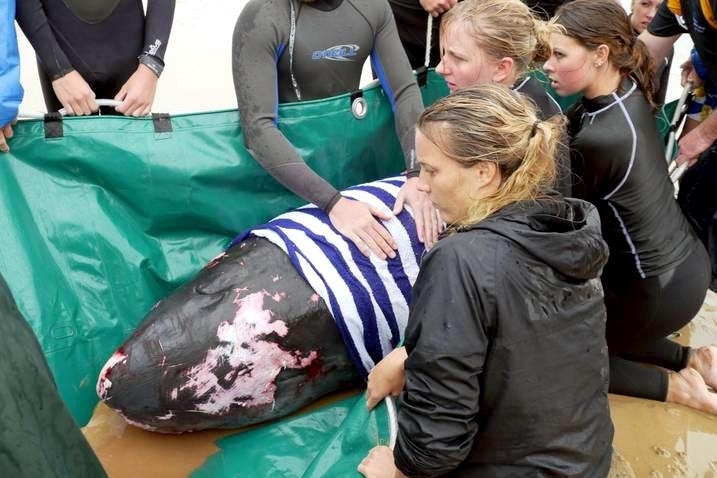 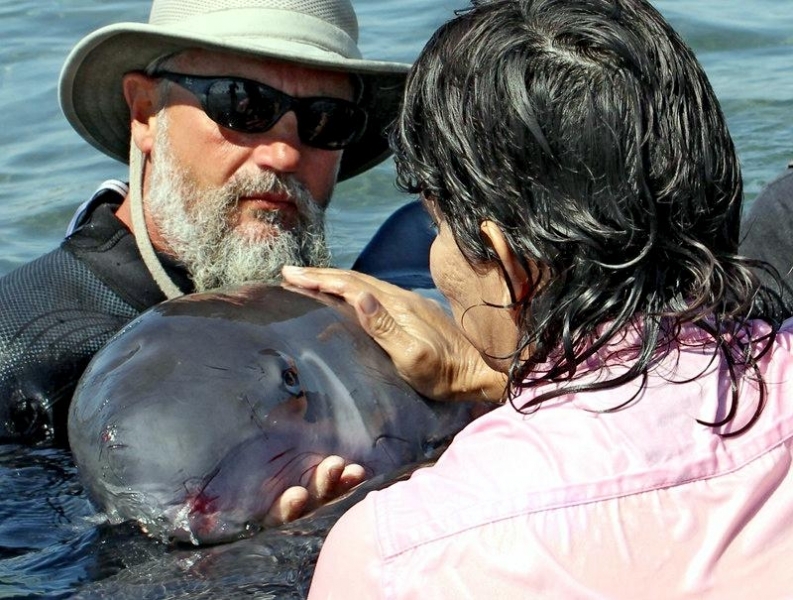 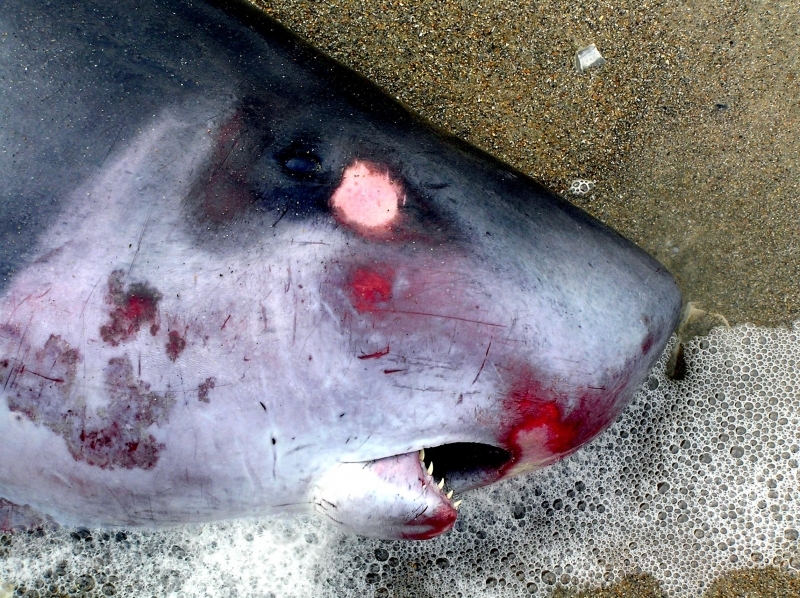 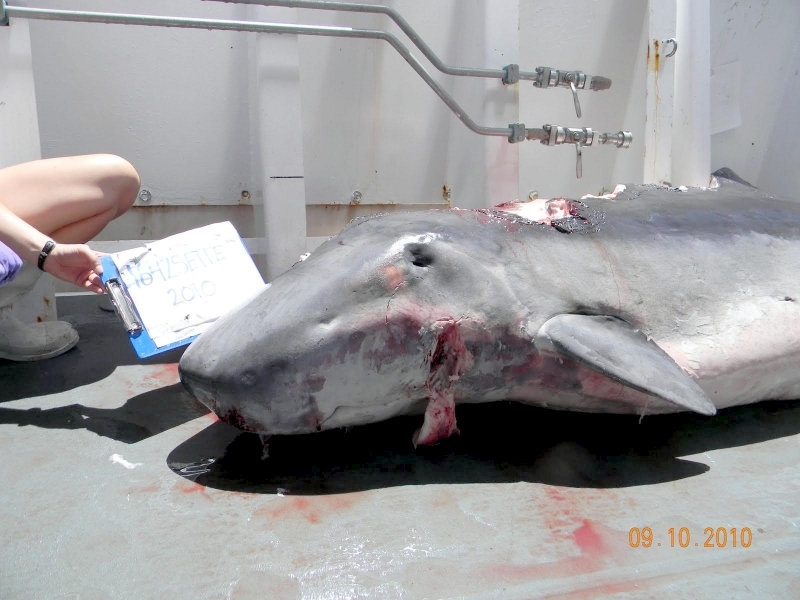 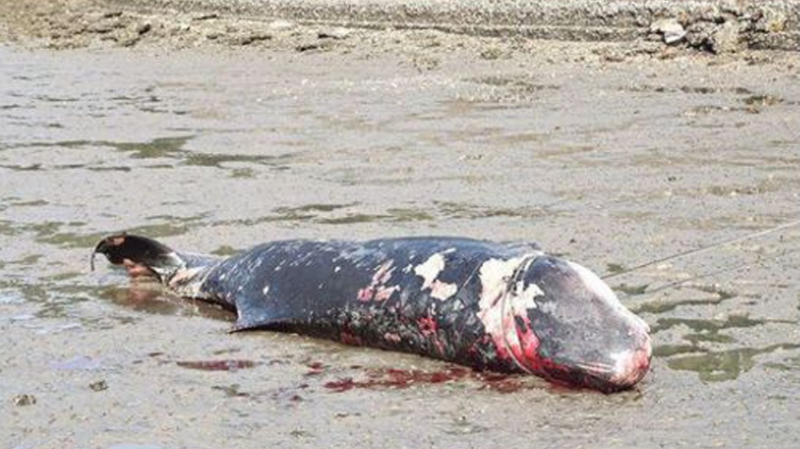 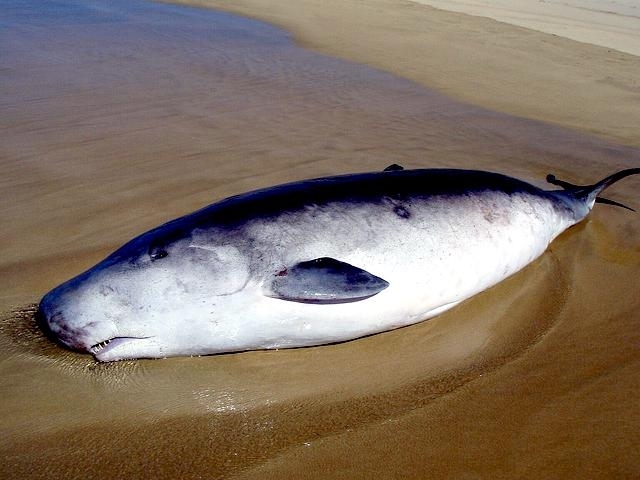 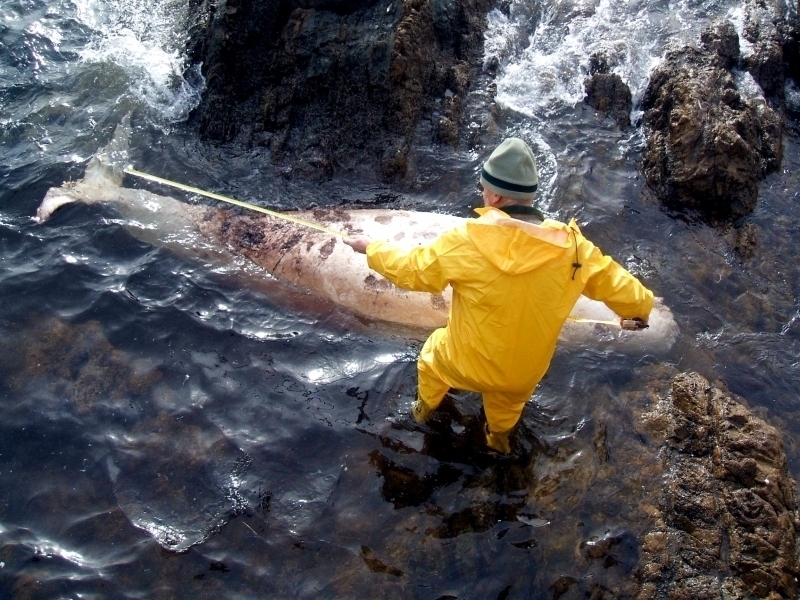 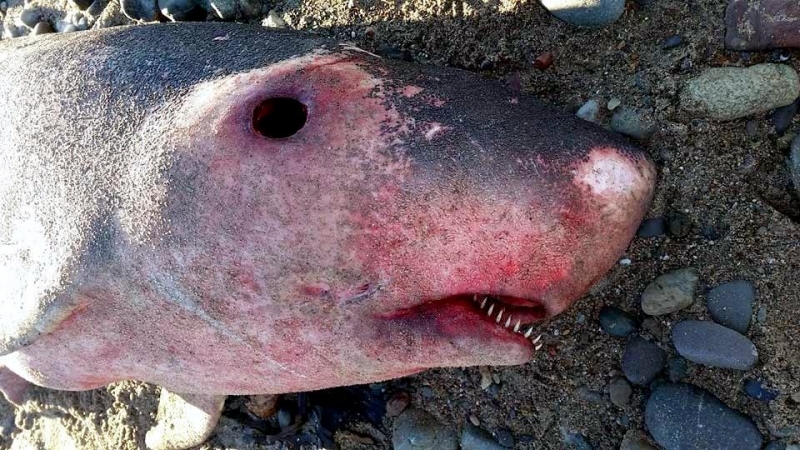 Attempts to rescue stranded Pygmy Sperm Whales have been unsuccessful. 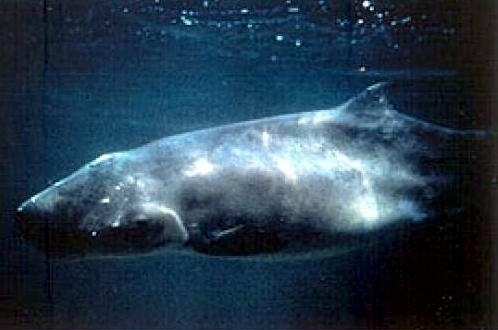 Pygmy Sperm Whales may be found in all temperate, sub-tropical, tropical waters and are not known to migrate. 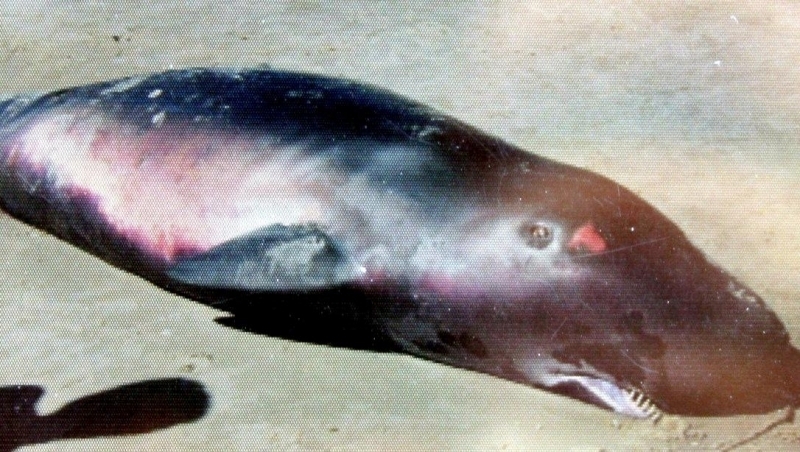 Population figures are unknown but they are not considered endangered. 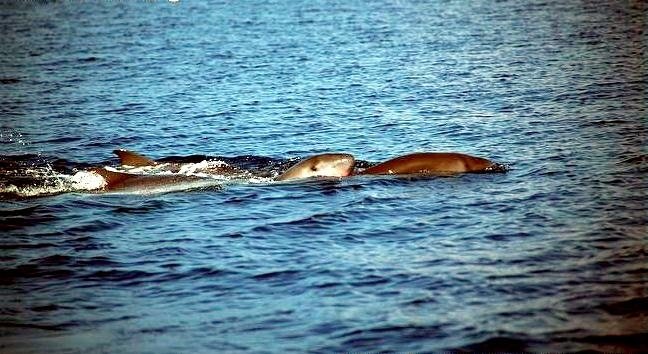 They are known to feed on octopus, squid, crab, fish and shrimp. 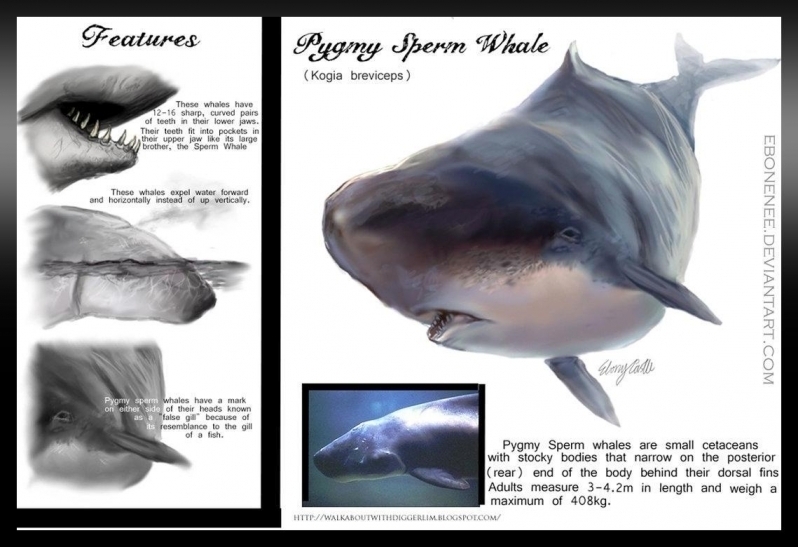 Males sexually mature at 2.7-3 meters, females at 2.6-2.7 meters. 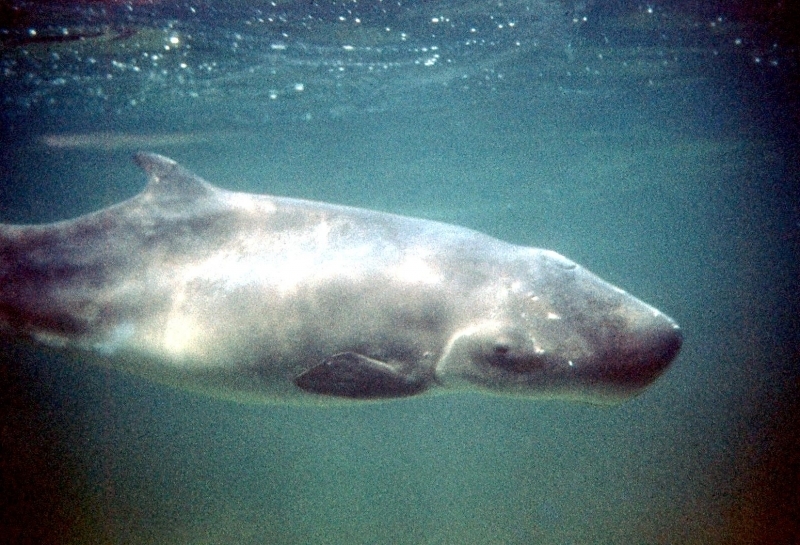 There is some evidence that Pygmy Sperm Whales reproduce annually with calving taking place between spring & autumn following an 11 month gestation period. 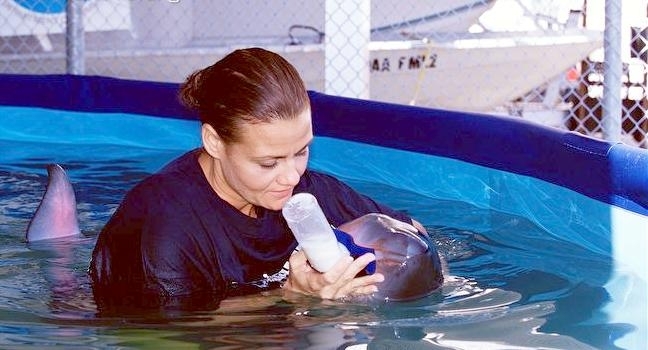 Calves measure about 1.2 meters at birth and weigh about 55 kilograms.